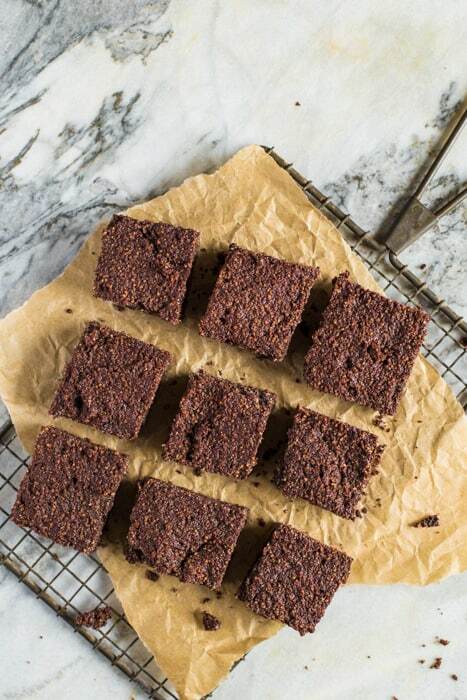 These Dairy and Gluten Free Chocolate Brownies pack a real punchy, chocolatey hit. They’re great as a mid morning snack alongside a strong black coffee. Do you know what I most miss about being lactose intolerant? It’s the freedom to walk into a cafe or restaurant and just choose something off the menu that I fancy to eat. When you have an intolerance or allergy, reading a menu often turns into an assault course. 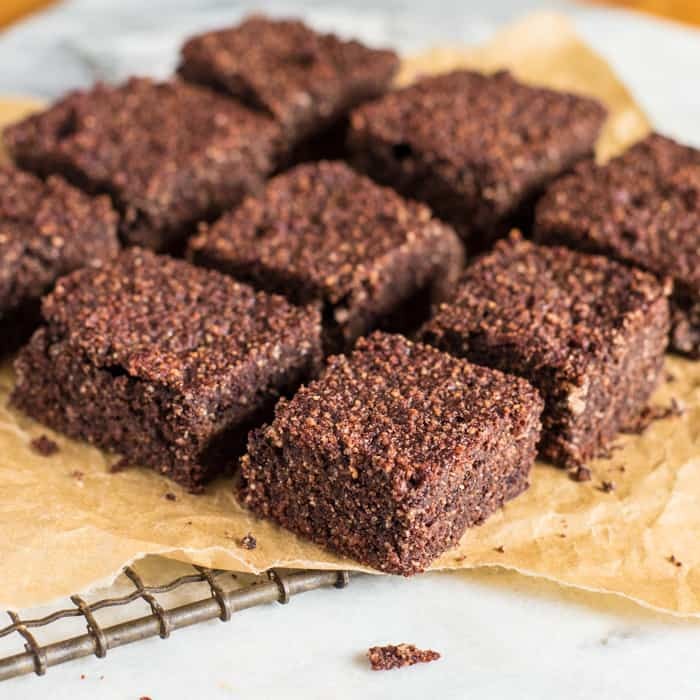 So when Comvita asked me to recreate their fudgey chocolate brownies (that were naturally gluten & dairy free) my instant chocolate brownie craving turned the exercise into a no-brainer! 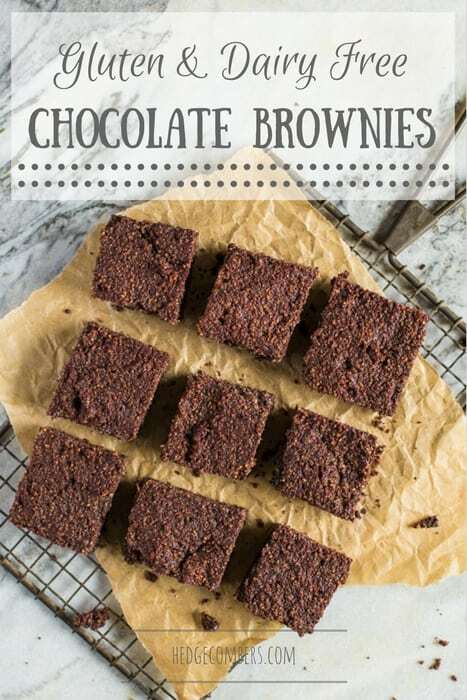 I used Comvita’s Manuka Honey UMF 5+ in the brownies which gave them a wholesome, nourishing sweetness. If you were making them for children (or those with a much sweeter tooth) then up the amount of honey as suggested in the recipe below. I’ve spent the morning reading up on the benefits of using Manuka honey and it makes for a fascinating read. Apparently the bees feast largely on the Manuka trees found only in New Zealand. Manuka boasts the same antibacterial and antiviral properties as the closely related Australian Tea Tree (Melaleuca). The bees that pollinate these trees pass on these healing attributes to the honey that they produce. To ensure you are buying top quality Manuka honey look for a jar that comes with a ‘UMF’ or Unique Manuka Factor. This is an internationally recognised quality mark that guarantees the level of active ingredients specific to this honey. The higher the number, the more active compound within the jar. 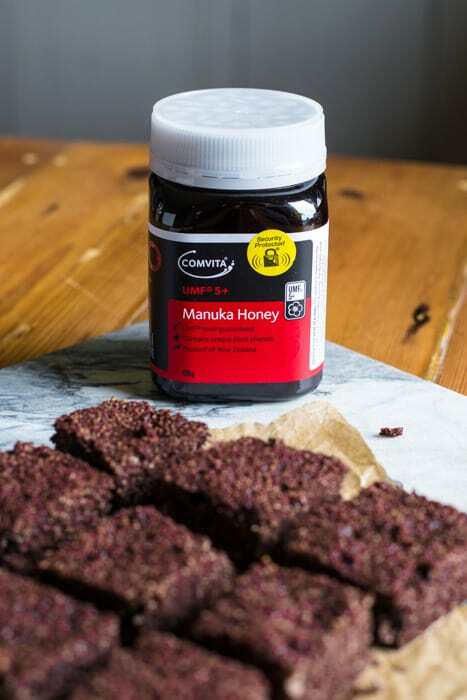 You can apply Manuka honey topically (think open wounds, skin lesions and burns), by the spoon (great if you feel a cold or virus coming on) and as the Manuka magic isn’t destroyed by heat you can make a soothing honey and lemon to sip on. In this recipe Comvita have replaced the wheat flour with coconut flour and the butter with coconut oil. The result is a lovely, dense brownie that tastes rich but clean. They’re yummy. For more Manuka inspiration, head over to my good friend FoodieQuine to grab her scrummy Rhubarb Streusel Manuka Honey Muffins recipe. Yum! Line a baking tin with baking paper. Ideally use a square tin that measures 7", however any baking dish that allows you to get the mixture flattened out to around an inch in depth will work well. Mix all of the ingredients together in a bowl, ensuring that there are no dry ingredients left showing. Pour into the baking dish, flatten with the back of a spoon and bake for 30 minutes, or until a skewer comes out clean. Lift the baking paper out of the tin and place onto a cooling rack until cooled. Cut into 16 squares and store in an air tight tub. Huge thanks to Comvita for sponsoring this post and allowing me to continue bringing you yummy recipes, for free. Comvita has been producing world-renowned UMF® Mānuka honey since 1974 in New Zealand’s Bay of Plenty. As always all thoughts (and leftovers!) are my own. That looks delicious. Last of your recipes I have tried came out great so hopefully this one will as well. Awesome news Iss, fingers crossed you love this one too!